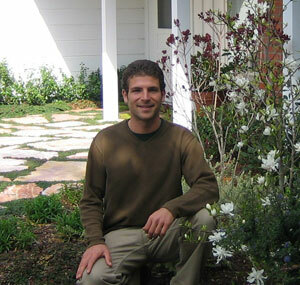 Leith Carstarphen is the landscape designer and project supervisor for Ecologic Landscaping. He holds degrees in Landscape Architecture and Horticulture. Leith has been working in the San Francisco Bay Area in the field of landscape design, construction, and maintenance since 1994. Leith regularly leads workshops and classes on sustainability issues. He has a passionate commitment to edible and useful plants, and is an avid home gardener. With over 13 years of experience in Marin County and the San Francisco Bay Area, EcoLogic Landscaping has the knowledge and expertise to create your garden from concept to completion. Our skilled crews have extensive skills in constructing gardens of exquisite craftsmanship and lasting beauty, using sustainable and organic materials and methods. Our primary goal is to facilitate dynamic, meaningful relationships between our clients and the land. Our services include all facets of landscape construction: patios and pathways, rock walls and retaining walls, waterfalls and fountains, decks, arbors, fences, drainage systems, irrigation and dramatic lighting. Whether renovating an existing landscape or creating a new garden, our commitment to excellence will show in every detail. We believe that the best gardens grow naturally. We use only the finest organic fertilizers to help your landscape grow and mature. We never use harsh pesticides or herbicides but instead rely on non-toxic alternatives that are safe for your family and pets. Our gardens support thriving ecosystems, and pests are controlled naturally, by beneficial insects such as ladybugs. Flowering plants will attract hummingbirds, butterflies, and songbirds to your yard. We create thriving ecosystems for all the microclimates of Northern California, whether shady or arid, and we strategically design landscaping to optimize growth and conserve water. We create gardens that are not only beautiful, but also provide an abundance of fresh food. Imagine strolling through your garden with your children and harvesting perfectly ripe berries, vegetables, and culinary herbs. Your food will taste better, contain more nutrients, and be completely free of chemical residues. Click here to see the recommended organizations.